Confession: This is as close as I have gotten to Europe, not that I'm complaining! 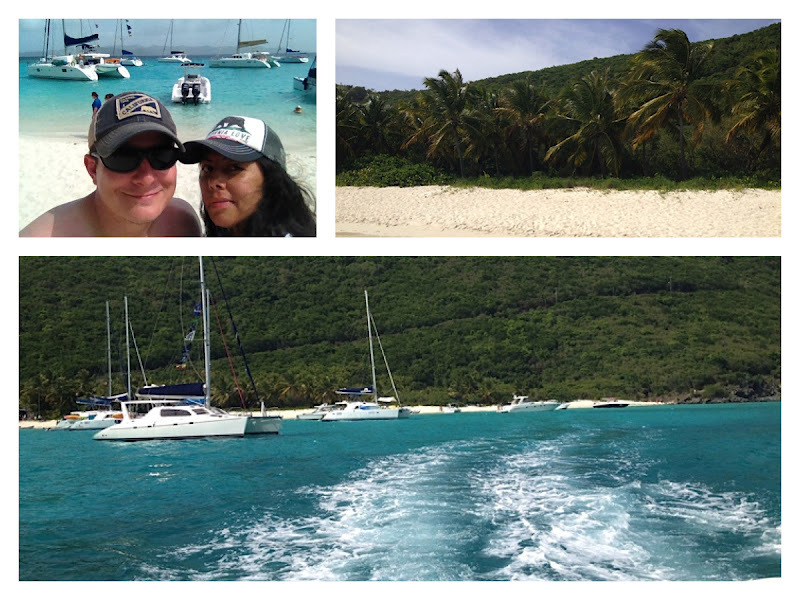 We made our way over to Jost Van Dyke in the British Virgin Islands because it would have been a sin not to come here. 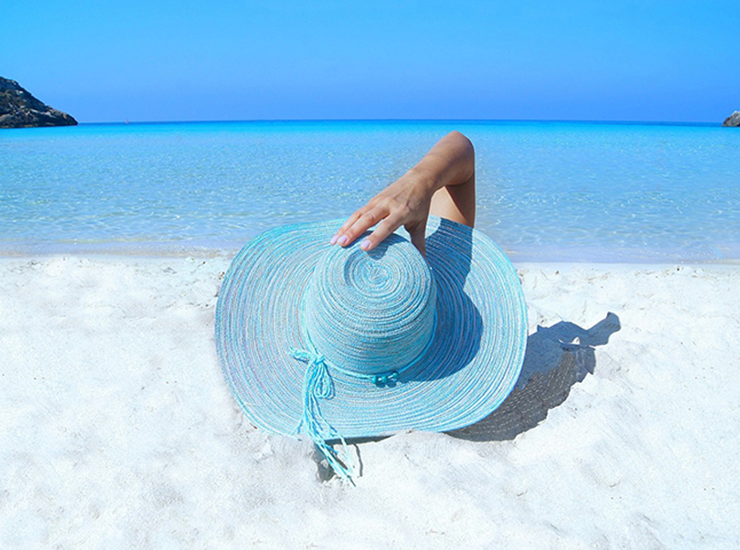 With a population of about 220 this is a sweet little island with the most beautiful white sand that feels like heaven on your feet. 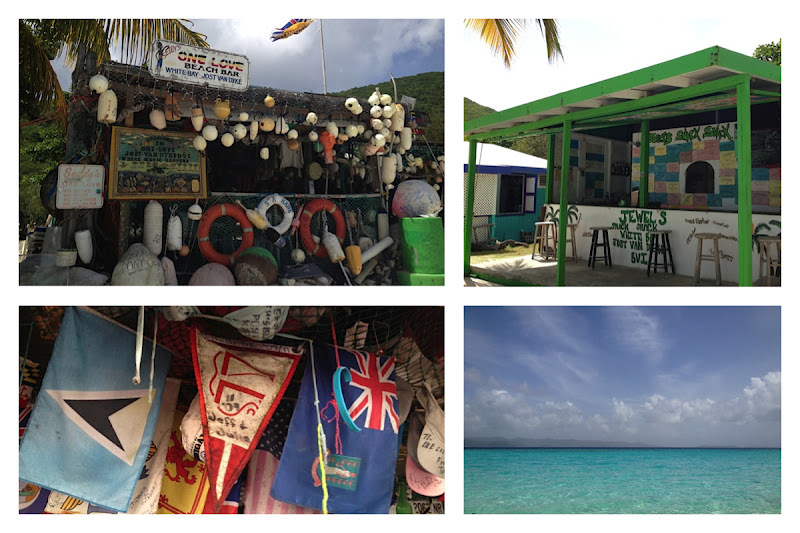 Jost Van Dyke is is accessible by boat, ferry, water taxi and a lot of people anchor here and chill the night away. B and I left our yacht in Texas (haha!) so we only stayed for part of the afternoon before making the 7/12 miles back to St. John across the way. I've brought you over to the Soggy Dollar before as seen here and it is perhaps the most famous spot on this island. 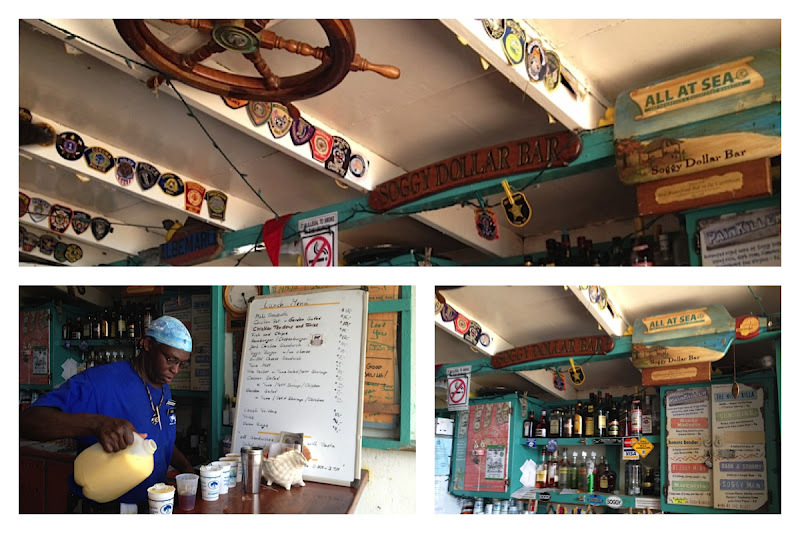 There are a few other bars to explore so after you have your Painkiller at the Soggy Dollar, keep on walking! We had a Bushwacker over at One love and it was super good, perhaps a new favorite drink for me. 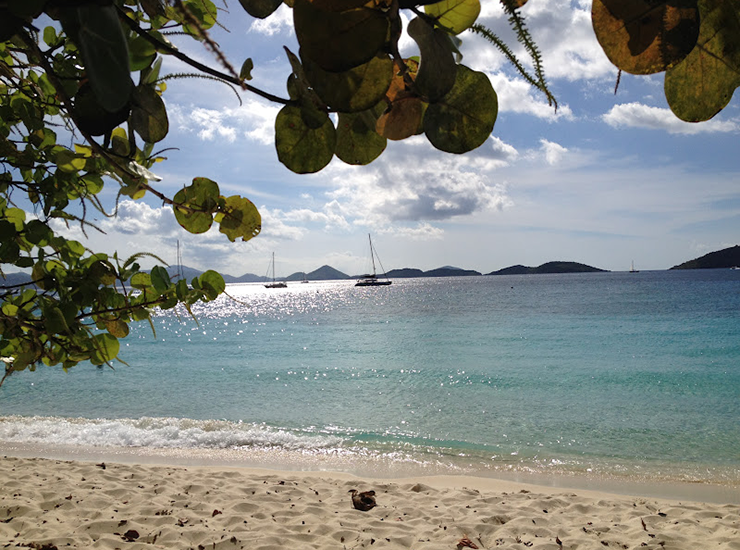 You could stay over on Jost at the Sand Castle Hotel and don't worry things are pretty casual on the island, all you need is a suit (bathing suit!) and a few soggy dollars from swimming from your boat to the island and you are good to go. The swim is more like a waist high walk so don't fret! The Soggy Dollar got it's name because there is no dock so you do have to jump off your boat and that's where your dollars may get soggy. But they are still accepted and in fact, they have a cute clothing line set up behind the bar where they let them dry. Are you in? It's hard to say no to this beauty and even harder to pull away but until next time! What's your favorite tropical drink? Oh my gosh, I am WAY jealous that you went there! How funny that is the island I mentioned on your post the other day, and you had already planned to go. That water is GORGEOUS. I can't get over how pretty it is. What a fun island! LOVE LOVE LOVE these pictures friend! xo. Fruitas con leche from Costa Rica. 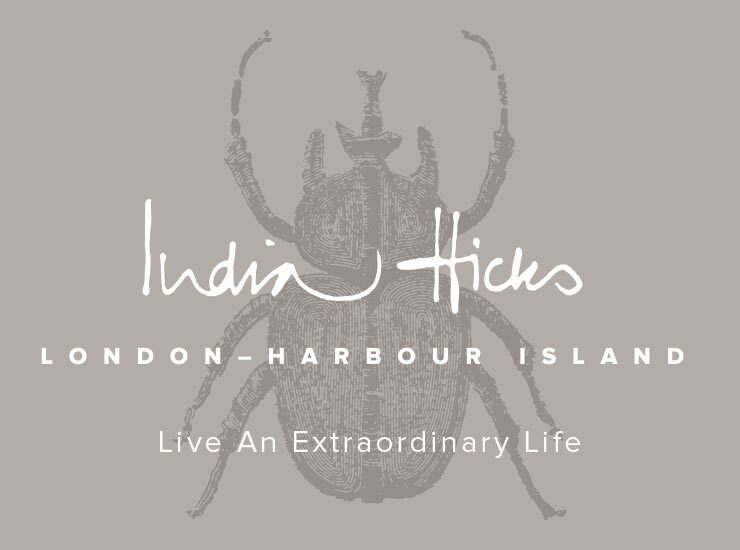 Thanks to your lovely BVI and St. John posts, you've taken me on a trip "home", down Memory Lane. 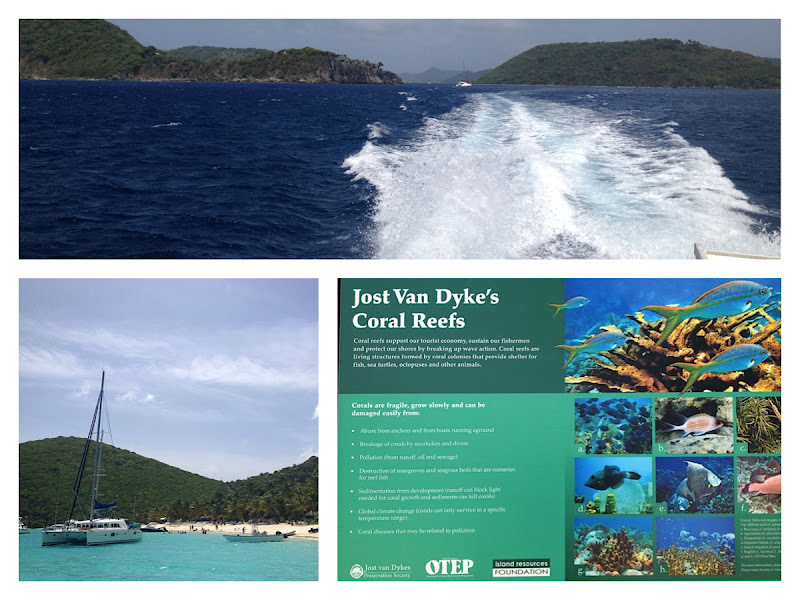 Doesn't Jost have the coolest, most laid back vibe? I'd forgotten about Jewel's! From your flag pic, looks as though you went to Foxy's, too...? I don't drink many tropical cocktails anymore (ugh - had too many? lol) but when I first went to Tortola, my favorite was rum punch with Mt. Gay or Cruzan. I used to make and serve painkillers to our guests when I crewed on a day sail cat called Ppalu...good old days but it made for some rather drunk guests. ha! At the end of the day (and sometimes during) all the crew would drink what was left...couldn't let those painkillers go to waste. Loving these posts, Laura! More coming, I hope! My favorite tropical drinks are hard to find, because they are well made tiki's! Love a Polynesian Paralysis or an authentic Mai Tai!